Kobi Shely on "FilmDIY -- The Filmmaker's Guide To The Interweb"
As always, it all started from my own personal experience and an eagerness to overcome frustration. I’ve been producing and directing films since 2000. Many of them were broadcast in TV channels around the world, some of them won prizes in film festivals. But my true love, both as filmmaker and viewer, was movies made for niche audiences. As an Israeli based independent filmmaker, I used to rely on public funding, which is quite developed here, much like in Europe, especially compared to the system in the US. Receiving $60,000-$100,000 for a movie just by preparing a written proposal and a short trailer can get your movie project started, but there are drawbacks: competition is fierce, and you have to abide by implicit tough rules regarding both your movie topic and the way you make it. When I chose not to obey, the answer from film funds was always negative. There’s not much one can argue about when trying to define ‘artistic considerations’, even when you know that art is a personal choice. But since I owned a post production facility, and a production house, I could allow myself to make my own movies from time to time, even without public support. Then in 2007 I decided produce a film about Apple fanatics, a DIY effort that I’ve put to the test. I wanted to make a movie I was passionate about knowing it will never get government support. Finally, we produced MacHEADS totally independently from pre-production to distribution. Back in 2007 it was not the traditional route to skip film festivals and go straight to digital distribution. The stigma back than for going digital, was “straight to DVD” strategy, admitting you couldn’t find a distributor to buy your movie, not something every filmmaker wants to be associated with. iTunes movie service started only in 2008. We knew we could get more audience to see our movie the digital way, so we went for it, and we were right. From Tel Aviv in my studio apartment I was marketing and distributing MacHREADS to the world. No film festival could have achieved the same buzz created on the Internet. At some point I made a decision not to apply to film festivals, paying $50 to a small film fest didn’t make any sense. We premiered the movie on iTunes and MacHEADS became number one in its category and number 8 at the 2009 top 50 documentaries. Hulu made 285,867 views (and still counting) And also became number one top movie in all categories/ Than the Netflix deals came and Snagfilms, and was finally broadcast on CNBC. My personal experience with digital distribution was quite a learning experience. A lot is unknown to filmmakers even today when stats are coming out and the “wall of fear”, as I like to call the terror that agents and distributors are putting on filmmakers not to share information (They do that with contracts signed for secrecy) Is slowly overcome by many filmmakers who are sharing information with one another. We made some fatal mistakes with distributors agents, a small distribution company in Spain sold us the idea that they will know what to do with our film. It turned out they had no clue what is the film subject and how to get distributors to buy the film not to mention they had no idea what iTunes is. We suffered with a contract for 15 years without the ability to get out. The world distribution rights were sold to the Spanish agents, and that hurt us a lot, I can’t even start to think about the damage done to MacHEADS financially. Our digital distributors in the US at FilmBUFF did their part and did what ever they could to promote MacHEADS to every digital platform and also pitched in with marketing. In the end MacHEADS success and failure depended on my marketing efforts. Had the film been on iTunes without me pushing the movie in every possible effort, it would have never gotten the same response. So if you like it or not, filmmakers today are their own distribution and marketing managers, so why in the world would you give up your rights to get it on iTunes or even Netflix? This is where and why I set out to found filmDIY -- a digital distribution platform for indie filmmakers that will give filmmakers control over the digital distribution means, and get rewarded financially as they should have been in the first place. I wanted to offer the indie film community the best possible solution I can give them. VOD portals are not new, but we were thinking about our colleagues. The main problem with any indie sales platform is still discovery. Without marketing effectively your content won’t be discovered. So we are not settling on a distribution tool only, we are also putting an emphasis on marketing. • Filmmakers receive their payments immediately -- there’s no need to wait for reports or ask for a money transfer or a check. Each rental or purchase creates automatically a transaction in the filmmaker’s PayPal account. We take 30% -- which covers also the cost of streaming and support. The issue of transparency is our core function. We are the first service to offer automatic split payment, it’s as if the filmmaker has his own VOD tool at his disposal. We encourage filmmakers to test us and see for themselves. All they need to do is send us their PayPal email address and we create a demo to showcase the service. • Rental and Download to Own -- those two options are available for every movie. Download to own is an interesting tool, most times people rent a movie and than decide to buy also a digital copy to own, so filmmakers have more opportunities for revenues. • Filmmakers set the price. We recommend on prices, but the final decision is made by the filmmaker. • Personal profile page for each filmmaker, which makes it practically a mini-site for filmmakers. • Handling all technical aspects of encoding, image optimization, costumer support etc. -- As we found out, many filmmakers don’t want, or are afraid of dealing with those things. In addition, we ensure this way a unified look to the movie pages. • Infinite distribution -- a Watch Now banners can be embedded in the filmmaker’s website or in any other website. Payment and presentation of the movie are done in the hosting website, which makes it a White Label for filmmakers who want to sell the movie from their own website. 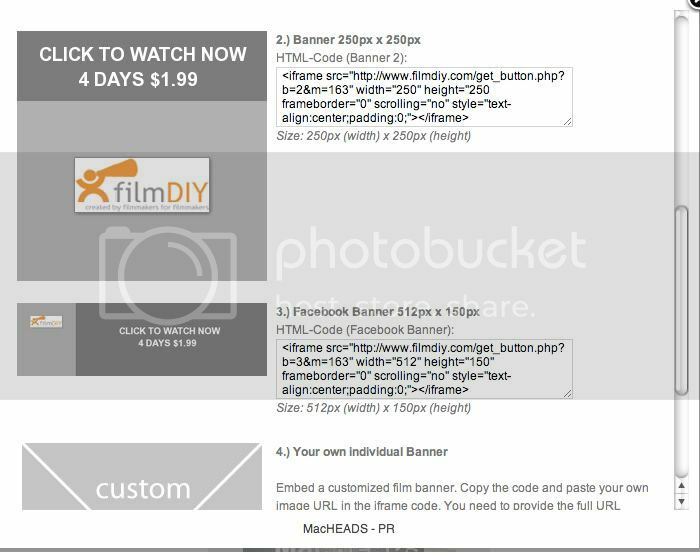 In addition we help filmmakers create a Facebook app to rent movies from their fan pages. • filmDIY is also a place for viewers to find more content, we are marketing filmDIY.com not only for filmmakers but also for audience. That’s why each movie page has reviews, festival screenings, still gallery and all the information needed. Joining filmDIY means you get more chances to get your movie the possibility to be exposed to more people. • We are also developing an automated mechanism which matches together relevant movies to analyzed content in partners’ websites. It’s more or less the Google Ads of movies (where movies are the equivalent of ads). In this case, the partner website will receive its own share, which will further help the filmmaker distribute her movie. Why did we choose to specialize in the indie market? -- First of all, it’s often overlooked by investors, and large media companies, because it’s so fragmented. We believe this to be a mistake. True, marketing niche content is challenging, but the audience is loyal and is happy to help by spreading the word. The second reason, which is totally emotional and therefore the strongest, is that we’re indie filmmakers ourselves and simply love it. We are not resting and always developing more solutions for indie filmmakers. The industry is in a dynamic process of technology change, and filmDIY is always on the look out to incorporate new and exciting models. We are now working with investors on a truly revolutionary system that we believe will break the current way of distributing films. Kobi Shely Co- Founder. In January 2009, Kobi Shely launched the documentary film MacHEADS on iTunes. The buzz was immediate and overwhelming. MacHEADS generated over a millions hits on YouTube and Dailymotion. It was a No.1 documentary on iTunes, Hulu, Snagfilms, Amazon VOD and finally on CNBC. In the months after the digital launch, Shely soon came to realize that he would be the last to benefit from the profits party, and he wanted to be the first, so he co founded filmDIY.